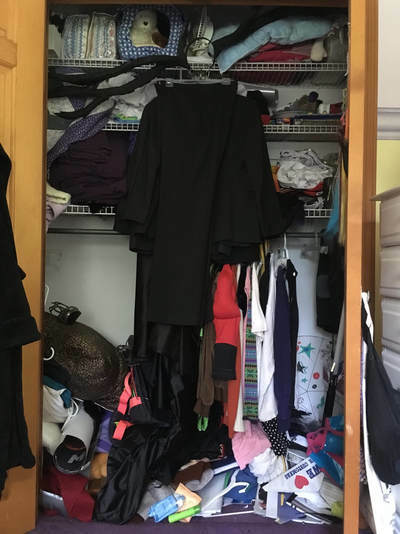 Check out some of our Before and After shots to see how The Closet Magician can help organize your Closet. Testimonial: "I didn't know how I was going to be prepared for my open house. Bobbie was very helpful and I would recommend her to anyone who is moving. I plan on calling her to help me set up my kitchen after we move." Problem: Dolores had moved in four months ago but she still felt very unsettled in her new apartment. She wasn't sleeping well and felt anxious . Solution: Bobbie helped Dolores categorize her supplies and contacted Maintenance to double shelve two closets. Then everything fit perfectly. Scarves and hats were stored in a hanging shoe organizer to make it easy for her to reach everything safely. Result: After everything was stored Dolores and Bobbie hung the prints on the walls and Dolores felt truly settled. Testimonial: "There wasn't anything on the walls so my apartment felt "empty." I feel like I live here now and can't wait to have friends over." Problem: The shelves in Kathleen's pantry were bowing or broken. She loves to take advantage of a good bargain but was wasting a lot of money on expired food. Solution: We put the heavier canned goods on the bottom shelf and put small items in baskets. We discarded expired food and used a cardboard box as a temporary shelf. Result: Kathleen can quickly and easily take an inventory of what she needs from the market. No more wasting money on expired food! Testimonial: "Bobbie is very affordable. Once you hire Bobbie for one project you will want her back to organize another area of your home." Problem: Hailey lives in an older home with limited storage and office supplies and toiletries were all thrown together. There was no place to put her supplies for her volunteer work. Solution: We categorized her supplies and put them in appropriate sized clear plastic containers. Bobbie helped Hailey create a system for processing papers to keep the closets organized. Solution: Hailey knows where to find what she needs and has a system to keep up with the mail and filing important papers. She can use the empty storage bins for her supplies for her volunteer work. Testimonial: "I was feeling stressed because I couldn't find things. Now I know where everything is. Thank you, Bobbie, this is wonderful!" Problem: Josephine’s has a historic home with very small closets that were overflowing and the gift wrapping supplies were out of control. Solution: She discarded and donated almost half of what was in the closets and contained the wrapping paper in a large new kitchen trash can. 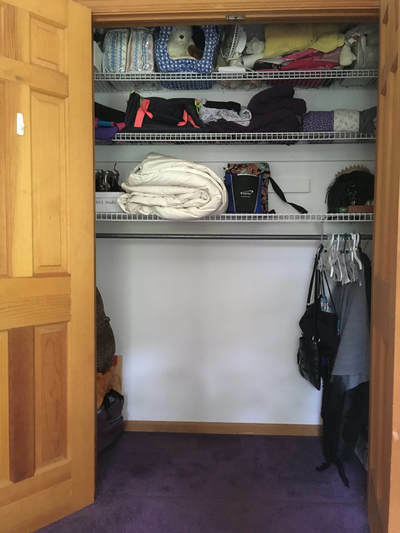 Result: Josephine is thrilled to have empty shelves for items that don’t fit into other closets in her home. ​Testimonial: "My husband and I plan on having Bobbie return to work on our family room. I highly recommend Bobbie for any organizational need you may have." Call Bobbie today to schedule a consultation!